Authorities say a white van driving at high speed barreled through people, killing at least 13 people and injuring dozens. breaking news. A van plowing into tourists on one of the most beautiful streets in one of Europe's most beautiful countries. 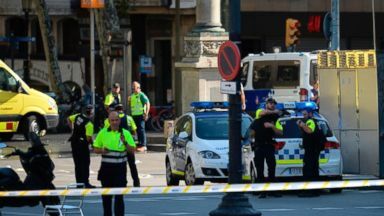 There are fast-moving developments on the ground in and around Barcelona Spain right now, and James Longman is right there. Reporter: An all-too-familiar scene, with terrorists striking another major European city. The dead and wounded lining the streets while others flee from the carnage. Barcelona joining a growing list of European cities targeted in recent months. London, Manchester, Paris. The attackers using an increasingly common tactic, turning a vehicle into a weapon of slaughter. This time the assault left 13 dead and more than 100 injured. Tonight south of Barcelona, police killed another group of alleged terrorists in what they're calling a related attack. 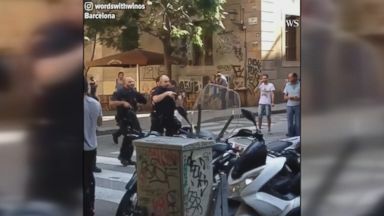 The Barcelona attack began just before 5:00 P.M. On las ramblas in the heart of Barcelona. It happened in an instant. This white van driving on the road. It's difficult to explain. Reporter: The van mowing down pedestrians at what witnesses guessed was 50 miles per hour. When I saw it, he was traveling at high speed, knocking people into the air. Translator: I saw a ton of people screaming. 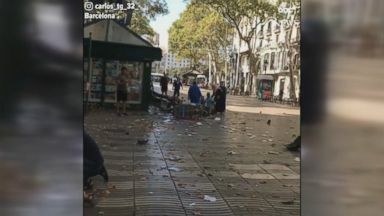 You could hear the van, seeing all the bodies there by las ramblas, I don't know, it was horrific. Reporter: The van careening down this path in red for more than 1,000 feet before coming to a halt, the front of the van smashed. We are right where the van mounted the sidewalk. You can see debris on the floor, discarded clothes. It came up here all the way down this street. People taking shelter, running into stores and restaurants. This woman and her family found sanctuary in a shoe store. I saw people running, and we stay in this store and don't leave. Reporter: These people from Connecticut arrived only today. They were left on lockdown in their hotel with no information for hours. So you were in your hotel when you heard a commotion outside? Correct. We heard there was a van that plowed into pedestrians down hi here with some injuries and that's how it started. We were not allowed to go out of the hotel. They closed the doors. Reporter: So the police came into the hotel and closed it down. Asked the manager not to let anyone to go out. Reporter: What were you feeling at that point? Scared. It was scary, not to know what's happening and just seeing people running outside. Reporter: Police on foot, guns drawn. Combing the streets in search of the assailants. Translator: This is clearly a terrorist attack, intended to kill as many people as possible. Reporter: Tonight police calling this 28-year-old Moroccan dress one of the terrorists. He recently arrived in Spain last Sunday and rented the van used in the attack. He was not behind the wheel today. Oukabir is now in custody along with another suspect. And a third man was shot and killed after running a police roadblock. Oukabir's Facebook page shows him resting on the beach, listening to rap music. But he recently shared this anti-semitic video whom he described as "True heroes." Reporter: Normally this is bustling on a summer night. Now it's virtually shut down, the only thing, security vehicles and their personnel. It comes straight out of an ISIS playbook. The group has urged followers to carry out similar attacks. Even detailing the type of truck to use. We can only expect to see more attacks. If you think about that it's so easy to do. The world is basically a soft target. You need no training. You need no equipment. You just need somebody who's got the wherewithal ability to pull off these horrible acts. Reporter: Today's attack once again a reminder of a troubling new reality for cities across Europe. I'm from London. I know we've had problems. Any western city is a target. Especially tourist areas. Not a complete surprise. Reporter: The images stirring up dark memories of similar carnage. Vehicles to create mass destruction. Bastille day, in nice France. 86 dead, over 150 more injured when a cargo truck plowed through a crowded promenade. There's another sound, shooting in the air. Reporter: Less than six months later in Germany. As many were finishing up their holiday shopping, a delivery truck barrelled through a Berlin Christmas market. It came through the entrance, hit the sides of the barriers and carried on past us. Reporter: 12 dead and over 50 more hurt. And this year, two attacks in London. In March, a driver struck down pedestrians on Westminster bridge, killing five and injuring at least 29 people. Then this summer. Get moving! Reporter: On London bridge, a van plowed into pedestrians. Three attackers jumped out of vehicle, stabbing people indiscriminately at a near by market. The idea that you could drive a car, 20, 30, 40 miles per hour into a very densely-populated area. You're going to harm or kill a number of people by the sheer force of what you're hitting them with. And so I think that it's a horrific crime. But it's also, if you're one of these people with such a sick bent, it's just too easy to do. Reporter: In the U.S., authorities are concerned about how easily a large truck could become a killing machine. The problem with that is you have all those businesses, restaurants, et cetera, that need deliveries. So how do you get vehicles to these locations? It becomes sort of a logistical nightmare in trying to shut down streets. Reporter: In may, the TSA released a report on the threat of vehicle ramming attacks in the U.S., recommending reporting to authorities any suspicions arising from the rental of large-capacity vehicles near large gatherings and creating barriers that create a serpentine path of entry. And it was just this past weekend when a car driven by a white nationalist plowed into a group in charlottesville, killing Heather Heyer and injuring at least 19 others. The car just plowed through hundreds of people downtown charlottesville. Reporter: Meanwhile, cities across the U.S. Have doubled down on their security efforts. And officials wasted little time in condipping this latest attack. President trump tweeting, the United States condemned the terror attack in Barcelona, Spain and will do whatever is necessary to help. Terrorists around the world should know the United States and our allies are resolved to find you and bring you to justice. Reporter: That message echoed by the Spanish prime minister. Reporter: But the words of politicians don't hide the fact that as ISIS strongholds in the Middle East crumble, attacks on soft targets in the west are increasing with more innocent civilians caught no tin the crossfire. Tune in to gma tomorrow for the latest on the unfolding events in Spain.